Don’t Just Recycle — E-Cycle! Old cell phone? Broken TV? Don’t throw them in the trash bin. Recycle them! Not only do your old electronics contain valuable components that can still most likely be used, throwing electronics away creates “e-waste” pollution. Unlike most trash that is either biodegradable or can be disposed of, electronics contain dangerous chemicals like lead and mercury that could poison our water sources. The excess of metal equipment also makes it harder to destroy this electronic trash. Countries like China are already used as major garbage-dumping grounds for electronic waste material. So how can you help reduce your “electronic” footprint? Look up places where your city provides electronic recycling centers. 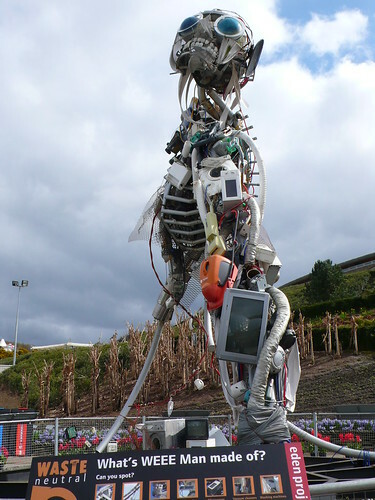 There are also websites you can find online that you can send your electronic waste to. If you’re trying to recycle an old TV or computer, you can have someone come by and pick it up for you. Taking out the recycling doesn’t have to be a chore. Still find recycling to be too much of a hassle? Do you need some more motivation or incentive? Companies like Best Buy offer trade-ins for select electronics that are still in good condition. Other places pay you for your old electronics. Another option is selling your old technology at pawn shops or even Craigslist, Amazon.com, or Ebay. Hey, if I can sell my old French college textbook for twenty bucks, you can sell your old 3G iPhone for tons more. If you’re more of a creative person, use your electronics for arts and crafts projects! GreenScape, a Japanese housewares and design shop, uses recycled electronic parts to create jewelry and accessories. Here at Smith, we hope that you will keep our Earth beautiful by recycling and reducing waste and pollution. For more information about reducing your carbon footprint too, take a look at our energy-efficient Smart+ homes.